Saturday – cheer on the Hawks in an upset win over #5 Penn State! 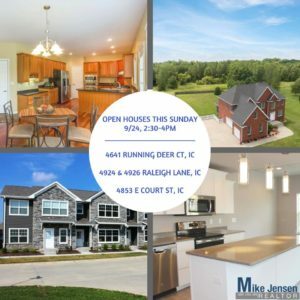 Sunday – come see us at one of our four open houses! Open this weekend is 4641 Running Deer Ct in Iowa City. A beautiful brick two-story walkout with fenced in backyard, located on 1.46 acres. Also open will be three brand new condos on the east side of Iowa City! Modern, bright, airy two story condos, close to Interstate 80, the bus line, and Cardigan Park. All of these homes will be open on Sunday, September 24 from 2:30-4. Come check them out for yourself! Hope everyone has a GREAT weekend! GO HAWKS!